James A. Coe & Co.
Mr. James A. Coe has been a potent factor in the iron and steel trade in this section of the country for more than a quarter of the century now passing away, and the house of James A. Coe & Co. has become firmly established as the supply depot for merchant iron and steel, corrugated iron, sheet iron and copper, tin , zinc, horseshoes and heavy hardware for dealers and consumers. The business was commenced in 1869 by Crowell & Coe, and continued under that name until the death of Messrs. J. G. and S. G. Crowell. In 1886 Mr. Coe admitted Mr. William T. McLaughlin to partnership and the style of firm was changed to James A. Coe & Co. Mr. McLaughlin had been the competent and trusted bookkeeper of the house almost from its start, and his death in 1895 was deeply lamented by his business associates and a wide circle of personal friends. From that date to April, 1900, Mr. Coe continued the business individually under the old firm name. The name of James A. Coe & Co. is still retained but the business is now operated under a New Jersey charter with James A. Coe as president, William P. Coe as vice-president, James D. Coe as treasurer and Charles A. Crane as secretary. The building occupied by the company was purchased by Crowell & Coe. in 1871. It is three stories high and has a ground area of 50 by 160 feet, at the northeast corner of Mulberry and Clinton streets, with a fifty by ninety feet extension. 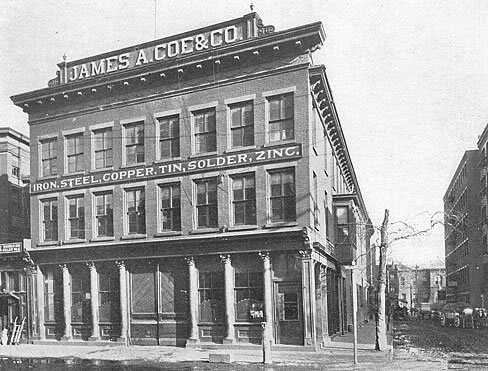 An incorporated company in Newark engaged in the handling of iron and steel in various forms is that of James A. Coe & Co., 106 and 108 Mulberry Street and 62, 64, 66, 68, 70, and 72 Clinton Street. This is one of the older and better known business houses of Newark and dates back to 1869 when Joseph G. Crowell and James A. Coe formed a partnership and traded under the firm title of Crowell & Coe. In 1900 papers of incorporation were filed, the capital increased to $125,000.00 and plans perfected for a more extensive business. The company is known all over the United States, and enjoys not only first class commercial rating, but the esteem and high regard of all who have entered into business relations with it. The executive management is vested in a president, vice-president, treasurer and secretary, the offices being capably filled at present by James A. Coe, Frederick M. Crowell, James D. Coe and Frederick S. Coe, respectively, and the last named gentleman also acting in the capacity of mechanical engineer. The company maintains a wholesale and retail department. A large warehouse is located at 483½ Mulberry Street and stables and another warehouse are to be found at 73 Marshall Street. The company employs fifty persons.